The kitchen looked as though someone had dirtied every dish and pan and countertop, and then run out in a panic. In the distance she could hear machine gun fire. The machine gun fire was coming from the TV in her family room, where her teens lounged on leather furniture, still in the t-shirts and sweatpants they’d slept in the night before. One stared, unmoving, at a movie on TV, one sat engrossed in Netflix on an iPad with headphones; the oldest was hunting and shooting camouflage-clad villains in a warehouse on a computer screen in the corner. “Have you guys been in here like this the entire day? ?” She asked. Many parents today worry about kids’ screen use during summer vacation. But what’s a parent to do? It takes too much energy to constantly suggest: “Why don’t you go outside for a while?” Parents already tired from work don’t want to start battles with teens who might become sullen, snarly, and disrespectful when asked to disconnect. 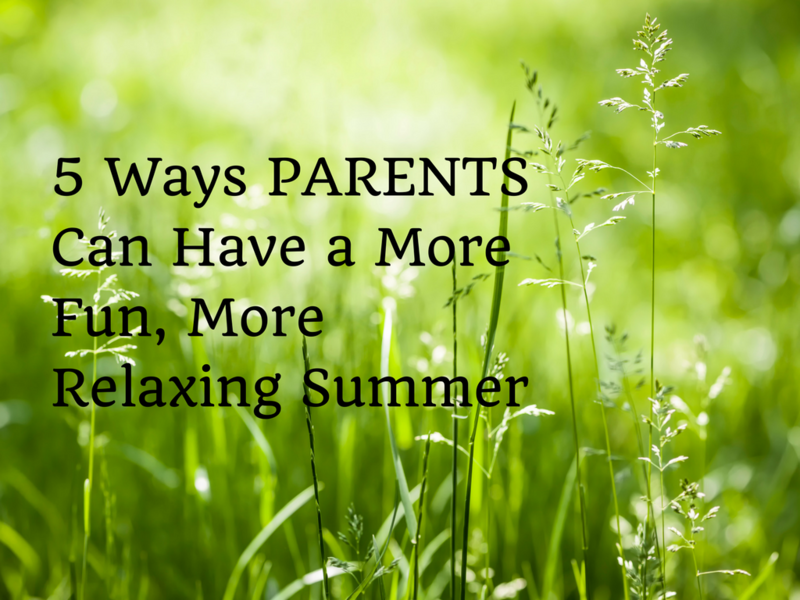 How can parents get teens to do more chores, spend less time on screens, and have more of the kind of summer fun that satisfies most deeply? 1. Realize that all-day screen use may actually be interfering with your kids’ summer happiness. Providing kids with some screen-free summer hours can help them to slow down enough to engage with summer activities and summer memories that satisfy far more deeply. 2. Set up a system that encourages kids to complete meaningful daily household chores without reminders and without pay throughout the summer. Plus, of course, you as a parent end up doing fewer dishes and less laundry. 3. Consider limiting screens and encouraging chores by simply asking kids to do other things first, before they flip on any “ON” switches. 4. When children refuse to comply with reasonable requests like the ones above, kindly give them some screen-free time to think over your requests and try again. 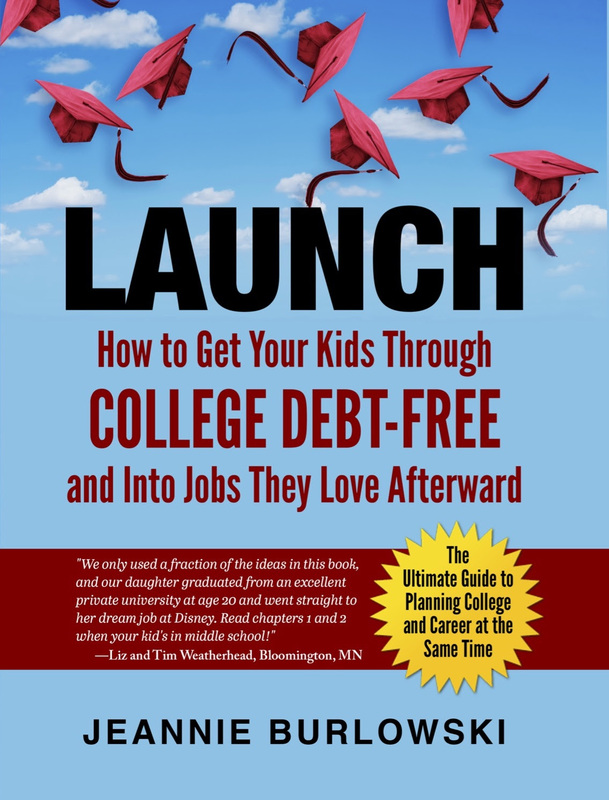 One suburban teen looked at a list like the one above and snarled: “I’m not doin’ that! You can’t make me! Who do you think you are, taking the TV and the computer away from me! ?” His wise mom didn’t even break a sweat. She just kindly and sweetly said: “John, I really think you can handle this. Why don’t you just take a screen-free day and think it over?” The next day when the entitled teen stumbled downstairs at 10:00 a.m. after sleeping in, he found that his mom had locked the power cords on all the TVs in the house and taken his phone and the home wifi router to work with her. 5. 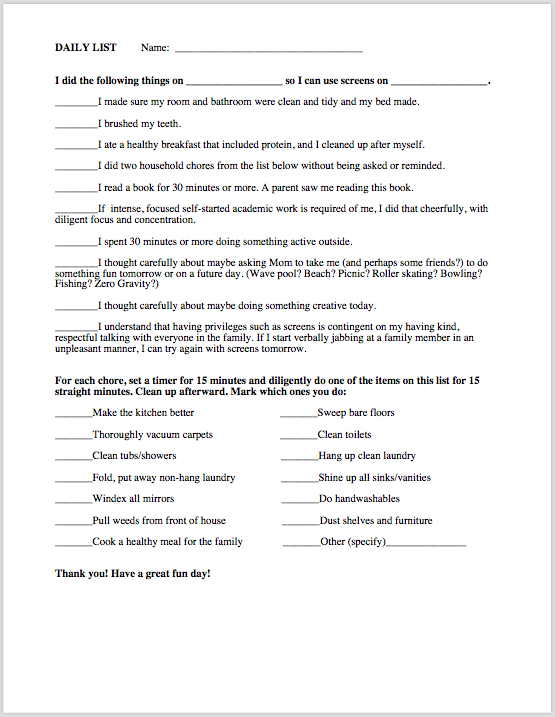 At the end of the day, notice the chores that kids have done and thank them for how they’ve helped the family. Verbalizing sincere thankfulness for the work they’ve done not only makes kids feel valued for their contributions, it also models gratitude and appreciation — two qualities very important for a happy life. What about you? What are your thoughts about screens and chores during the summer months? Comment below or LIKE Jeannie Burlowski Author on Facebook, find this post on that page, and let’s talk about it there. If you work at a school, you might suggest to administration that this article be added to your end-of-the-year parent newsletter. It’s free. All I ask is that you link to this post when you do so.